Teaching your child proper dental care at a young age is very important and the first step is an obvious, teaching them proper brushing. We have never really had a problem with getting our kids brushing. They both love brushing their teeth and getting new tooth brushes etc. We've always made it into a game using music (the "brush your teeth song" by Sharon Lois and Bram works great! ), the kids have fun and so do we. It makes it more enjoyable for everybody. We recently won a fabulous dental prize pack courtesy of @SunStarGUM and one of the items included was a Crayola Flashing timer toothbrush! Made with kids in mind, a blue LED light flashes for 60 seconds with the push of a button on the bottom of the handle, it's also got a suction cup end to stand it up when finished. This toothbrush helps promote proper, longer brushing pretty much making it into a game. We thought this toothbrush was pretty neat! What little boy wouldn't want his own flashing toothbrush, and knowing it's made by SunStar G.U.M we are sure the brush itself is quality for our children's dental care. 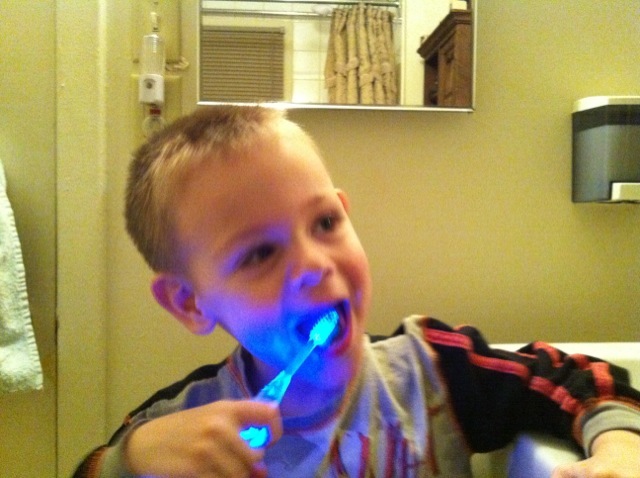 Our little guy loved using it for the first time, brushing until the blue light stopped. 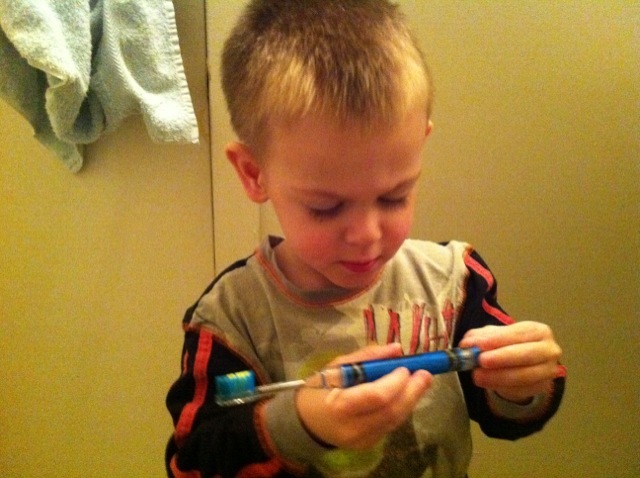 He liked it so much he wanted to press the button a second time to continue brushing as he loves to do. Simple, fun and an effective way to help teach proper, healthy brushing to your little first timers. 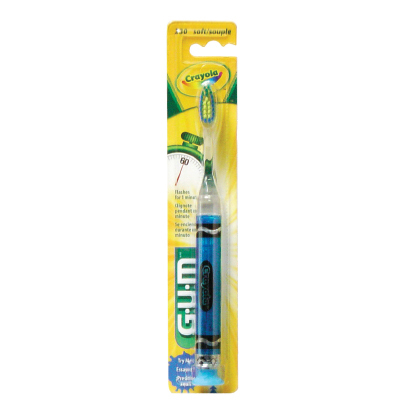 The SunStar G.U.M Crayola flashing timer toothbrush can be purchased at most drug stores or where dental hygiene products are sold!